Jeelius is an Argonian priest who can be found in the inner depths of the Shrine of Dagon. When he's not an involuntary guest at Mehrunes Dagon's shrine, Jeelius has a job at the Temple of the One in the Imperial City, where he will dutifully wander around the temple day and night. 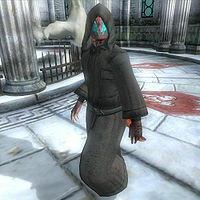 If you rescue him from Dagon's shrine and later visit him in the Temple of the One, he will reward you with free skill boosts in Alchemy (+1), Mysticism (+1), and Restoration (+1) as long as your skill levels in those skills are less than ninety. He knows a leveled set of priest spells. If he survives he wears a set of grey robes with a rare matching hood. He also carries a small amount of gold. When you first revive him in the Mythic Dawn shrine he will be disoriented about what happened to him; "Where am I? What is this place? Arkay preserve me, I remember now ... hooded men grabbed me as I was leaving the Temple ... We must get out of here! Come on!" Speaking to him again before you escape from the Mythic Dawn will have him say in a panic; "By all that is holy, we must get out of this hellish place!" Once he is out of harms way he will thank you, knowing that he would have died if you didn't intervene. "Thank you for saving me, friend. I don't know who you are, but it is clear that Akatosh guides you. I am a priest in the Temple of the One in the Imperial City. Perhaps our paths will cross again one day." If you ask him about the Mythic Dawn he will reveal he wasn't even aware of what the group was called; "Is that who they were? All I know is that they intended to sacrifice me to their dark god. If only I could erase the memory of that hellish place." If you meet him again after you rescued him he will more properly thank you for saving him earlier. "My friend! It is good to see you again. You risked your life to save me, a stranger. You are truly among the blessed of Arkay's children. As a small token of my gratitude, please allow me to share with you some of my small store of knowledge of the healing arts." Speaking to him again after he grants you this skill boost will occasionally have him greet you with: "Arkay's blessings upon you." During the Dagon Shrine quest, Ruma Camoran will require you to kill Jeelius in a sacrificial ceremony to show your devotion to Mehrunes Dagon, stating, "This pact must be sealed with red-drink, the blood of Lord Dagon's enemies. Take up the dagger and offer Lord Dagon the sacrificial red-drink, as pledge of your own life's blood, which shall be his in the end." Killing him at this time will not count as a murder in your statistics, and will not trigger the Dark Brotherhood questline. This page was last modified on 26 December 2017, at 21:12.